Boyer Bransden Mk3 Electronic Ignition for Triumph and BSA Unit Twins with 12 Volt electrics. This is a straightforward electronic ignition system, manufactured by Boyer Bransden, for the BSA and Triumph Twins. This will replace your existing points, condenser, and mechanical advance mechanism with an electronic pick-up, and a box to handle the processing and advance. 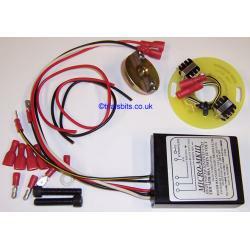 To use this you will require an existing good 12V power supply, and it is designed to work with your existing coils. This is suitable for positive or negative earth, and will work with or without a battery fitted. Boyer Bransden offer a 5 year warranty on all of their electronic ignition systems.